Linda Brown, who as a little girl was at the center of the Brown v. Board of Education US Supreme Court case that ended segregation in schools, has died, a funeral home spokesman said. Brown died Sunday afternoon in Topeka, Kansas, Peaceful Rest Funeral Chapel spokesman Tyson Williams said. She was 75 years old. Brown was 9 years old when her father, Oliver Brown, tried to enroll her at Sumner Elementary School, then an all-white school in Topeka, Kansas. When the school blocked her enrollment her father sued the Topeka Board of Education. 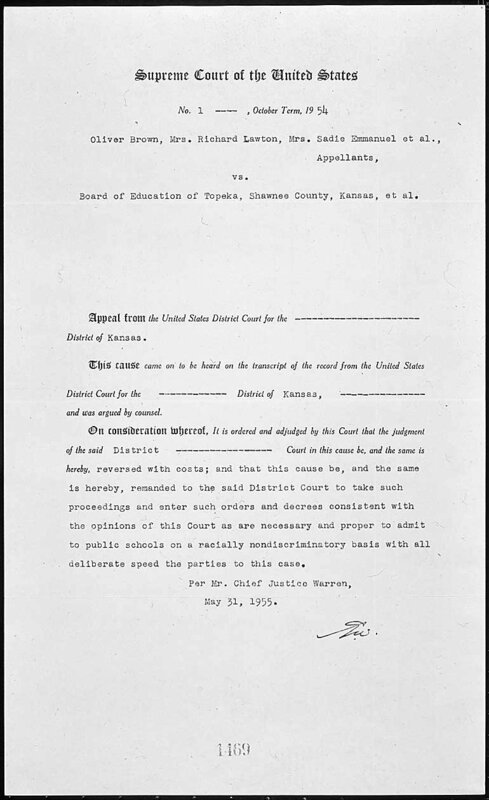 Four similar cases were combined with Brown's complaint and presented to the Supreme Court as Oliver L. Brown et al v. Board of Education of Topeka, Shawnee County, Kansas, et al. The court's landmark ruling in May 1954 -- that "separate educational facilities are inherently unequal" -- led to the desegregation of the US education system. Thurgood Marshall, the NAACP's special counsel and lead counsel for the plaintiffs, argued the case before the Supreme Court. Kansas Gov. Jeff Colyer acknowledged Brown's contribution to American history. "Sixty-four years ago a young girl from Topeka brought a case that ended segregation in public schools in America. Linda Brown's life reminds us that sometimes the most unlikely people can have an incredible impact and that by serving our community we can truly change the world."